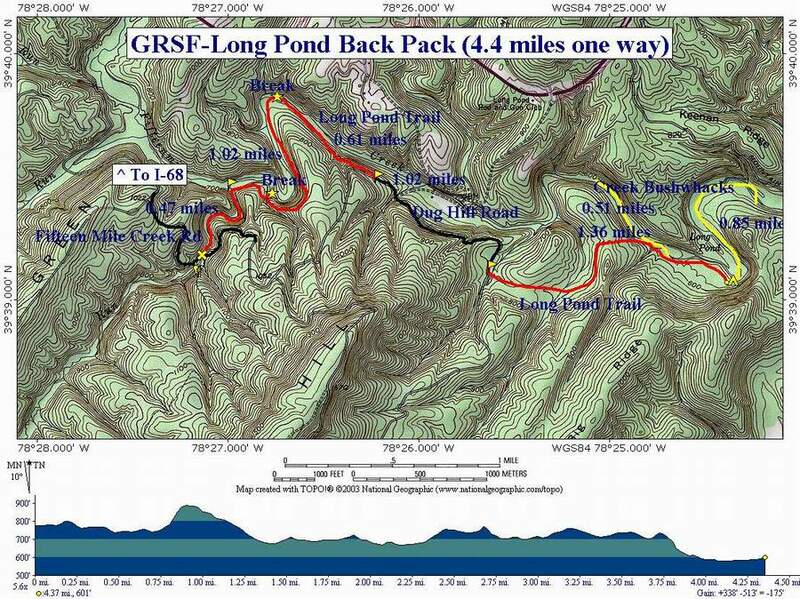 Description: 4.5 mile backpack in, 4.5 out on Long Pond Trail, Green Ridge State Forest, MD, w/ a 2 mile splash hike through the Long Pond section of Fifteen Mile Creek. This is actually a segment of a longer shuttle hike described in the C&O Canal/Long Pond Shuttle and includes the most scenic areas in the forest. 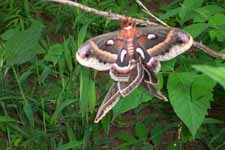 The length of the trip can be extended about 1.25 miles by starting at the Forest Headquarters off of M. V. Smith Rd but you miss a very scenic 0.5 mile portion of Deep Run in so doing and add a couple of more hills. The one closest to the Ranger's Station can be quite grueling even without a full pack. The hike starts on the north side of Fifteen Mile Creek Rd just after crossing a small bridge. 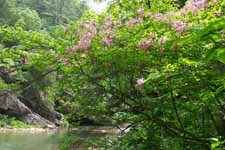 Trail Notes: From the Long Pond trailhead follow Deep Run downstream walking through Hemlock trees and passing scenic rock outcrops as you go. (Shortly after the start you will come to 2 yellow posts with mileage markers on them. Disregard them since there has been major reroutes of the trail system since their installation. One gives the total distance of Long Pond Trail as 7.0 miles. It is now 8.5 miles. BIG DIFFERENCE!) In the next 0.4 miles you will cross the stream about 6 times, crossing it for the last time at a signpost at the intersection with Pine Lick Trail and the confluence with Fifteen Mile Creek. Turn right and make the stream crossing. Long Pond trail will hug the side of the hill for a while but an easy open woods bushwhack across the bench or flood plain will lead you to some nice creek-side views. After the bench, the trail will climb slightly and soon bring you down to a smaller stream. Your route will take you across the stream and steeply up the side of the ridge. Before doing so follow the stream down to Fifteen Mile Creek to visit a great campsite with fire ring and stone furniture and an awesome view of the creek (0.2 miles from the last trail intersection). I think this section requires some splash hiking!!! After this visit rejoin the hike and climb almost to the top of the ridge. The descent is significantly more gradual and offers some great views of the mountains to the west and north. In about 0.8 miles from the last campsite, come to what I call The Oldsmobile Campsite. To find out why I've given it that name review Don's photos. Here again is an area worthy of a wading adventure or just a plain old aquatic frolic. After resuming the hike you will again climb steeply up the ridge passing "Slippery Rock Waterfall". An inadvertent step onto a large flat rock in front of it might tell you how the name was derived. Please walk around it! If you�re hot, walk under the cold water for a quick refresher. Immediately after this geological wonder an old animal trail goes straight and ends in a dead end on a very steep slope. DON'T FOLLOW THAT TRAIL! After the falls immediately make a sharp right turn and follow the white blazes to a higher elevation. Walk through some outstanding Hemlocks and White Pines until, at 0.6 miles from the Oldsmobile Campsite, arrive at Dug Hill Road. Turn Left onto Dug Hill and follow it for approximately 1.0 mile, passing a couple of primitive car camping sites on the left as you go. Turn left onto a gated fire road. There are some false fire roads along the way but stick with the blazes. Near the end you will cross a wildlife clearing. The trail is almost directly across but a little to the right. Descend steeply on another old forest road. Pass a shelter on a hill to the right. In 1.4 miles after leaving Dug Hill Rd arrive at the campsite to the left marked by a fire ring. If you find yourself climbing steeply up a hill you've gone too far. Turn around and look for the fire ring close to the bank across from a neat rock outcrop. If the site is taken or you want even more privacy follow the creek to just before it makes a hard left and cross it. Follow an old logging road a short distance to a beautiful stand of large Hemlocks right on the shore of Long Pond. Retrace your steps to get back to your vehicle. Printable/Downloadable Map View 3-D Map! A group of us did this hike as our first one of the season. We actually did not do the whole hike, but camped at what we think was the "Oldsmobile" campsite. However, we couldn't figure out why you call it that. I tried to look at Don's photos, but they are not longer available on shutterfly. So, what gives? Why "Oldsmobile"? It was a good first outing as it had some elevation and some water crossings. Even with all this rain, the "slippery rock" waterfall had no water....but it did have a slippery rock. It was fun, but nothing that would draw me back. M.R.Hyker Notes: Thanks for telling me about Don's photo links being broken. I removed them. As far as the Oldsmobile site ... there used to be an old Oldsmobile hubcap hanging on a tree there. I guess someone took it. Critique: I did this as a day hike. It's not too long, but parts can be strenuous. 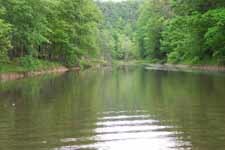 This is a hike for those who enjoy streamside journeys and interesting rock formations, with much of both. There are hikes right next to the stream, on ledges partway up the canyon walls, on ridges high above the creek with some vistas, an old logging road, and a short dirt road walk. 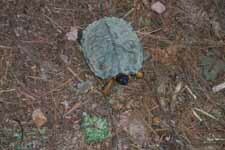 Solitude is easy to find, and wildlife was plentiful, including two woods turtles. 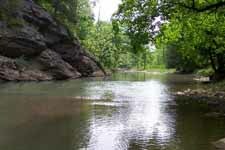 The best highlights of this hike are the multiple rock formations whenever the trail runs next to Fifteen mile Creek. A word of caution: the narrow ledges the trail sometimes follows can be scary to those who are scared of heights, and especially so when added with a steep trail slope. These areas could also be dangerous when snow, ice, or rain may be present. But other times just be careful and watch where you step, and this will be a very enjoyable hike. Critique: Thanks for all of your effort with this website. It's really a godsend for us "Weekend Warriors" in finding, planning and executing 1-3 day excursions. I started from the Ranger Station instead of 15 Mile Creek Rd. and found a nifty little side trail off of Pine Lick Trail down to 15 Mile Creek. Soon after leaving HQ, after crossing the second wooden bridge, turn left on the well-marked trail where the Pine Lick Trail T's and you'll quickly hit Long Pond Trail and two of the nicest campsites of the whole trip. I decided to hike all the way back the same day in order to camp at one! Big deep pools for swimming, huge rock faces with flat rocks for stretching out, clear sky view (full moon the night I was there) and lots of firewood. What more could one ask for? Be sure to note the intersection of the side trail and Long Pond Trail at 15 Mile Creek, as it's easy to miss on your return trip. I also go to Dolly Sods, but this hike is a miniature version with half the drive for me from Baltimore. Great hike...can't wait to go again. Critique: The scenery and challenge of this hike make it a wonderful option for a weekend outing. This trail is only 4.5 miles but it is challenging so don't underestimate the time it will take you to do it (on the way out we did it in right under 2 hours without stopping for pictures or breaks). On our leg out to the campsite we missed the right turn to stay on the Long Pond Trail and wound up hiking on the Pine Lick Trail for .5 miles before we realized our mistake at the footbridge. To avoid this, BEFORE the sign indicating the direction and distance to the C&O Canal locks turn right hugging the side of the hill and following a smaller tributary. The blazes will show up in a couple hundred feet and you'll begin climbing up the ridge. We crossed the stream and stood in front of the sign looking for the right hand turn and when we didn't see it we followed the trail behind the sign. Upon reaching Long Pond we had to cross into the floodplain to find an unoccupied campsite. I wish I had some bug spray b/c I was bitten 67 times (but I attract biting insects, my boyfriend has about 8 bites). So if you can camp in the sites along the creek do so, the breeze will help with the bugs. To be safe, bring bug spray. This area had hydric soils and I recognized some wetland plants so prepare for the bugs. The next day we did a day hike on the Long Pond Trail to lock 58 (4.5 miles one way). We hiked back, retrieved our hanging packs, and hiked the remainder of the trail to our car at the Long Pond trailhead. I had an excellent time on this trail. I will use it as a training hike for longer backpacking trips and enjoyed it as a weekend trip. comment: For a 4 and some odd mile hike, the elevation change is pretty drastic. It gives alot, beautiful streams, floral and fauna for days and the challenge of 300 foot elevation changes in a short period of time. For someone that wants a challenge, especially with a backpack trip, it is a great opportunity to get out somewhere close but worthy of the most seasoned hikers time.